"The absolute scum of the earth"
Yes, there’s now MormonWikiLeaks, for whistleblowers who want to expose the LDS Church’s secrets. One particularly useful feature of the site (on its front page) is its detailed information on installing and using the Tor browser (for secure, anonymous browsing and communications). Speaking of Mormons, Good4Utah.com reports six members of the horrific cult known as the Fundamentalist Church of Jesus Christ of Latter-day Saints (FLDS) reached a plea deal on Wednesday with federal prosecutors over a four-and-a-half-year SNAP (food stamp) scam in which FLDS members defrauded the federal government of over $12 million dollars in SNAP benefits, and handed them over to FLDS leaders who shockingly enough didn’t use them on food. The plea deal let all of the fraudsters skate, without jail time, probation or paying restitution. This might seem unjust, but one can rest assured that, in the land of “equal justice under the law,” the “punishment” would have been the same had the criminals been Muslims or atheists. Truthdig has a good piece titled The Truth About Jesus, which explores the historical background of Jesus and his followers and considers the historicity of the deeds and words attributed to Jesus in the Bible. The piece relies fairly heavily on the work of the Jesus Seminar, a colloquium of over 200 Protestant Bible scholars, mostly employed by religious colleges and seminaries, who undertook in 1985 a multi-year investigation into the historicity of the deeds and words attributed to Jesus. They concluded that only 18% of the statements and 16% of the deeds attributed to Jesus in the Bible had a high likelihood of being historically accurate. “Family values” South Carolina Republican representative and Confederate flag waver Chris Corley was arrested the day after Christmas for first-degree domestic violence. According to the arrest report, he beat his wife on the head and in the face with a closed fist before threatening her with a gun — in front of their eight-year-old daughter, who was recorded on the 911 call pleading, “Just stop Daddy. Just stop…Daddy, why are you doing this?” Earlier in the year, Corley voted to, yes, increase the punishment for domestic violence. Finally, in a story that has no obvious connection to religion, though it certainly seems that it should, Deadspin has published its annual list based on emergency room reports, “What did we get stuck in our rectums last year?” There are some real gems, both figurative and literal, in the list. Enjoy! Earlier today, I was disgusted to read of the pro-Confederate flag rally at the Alabama state capitol, and more especially of one jerk holding up a “White Lives Matter” sign. Yeah, right. As if there’s a decades-long history of racist black cops gunning down unarmed white folks, prosecutors letting them get away with it scot free, and the jackals at Fox “News” cheering on the killer cops. Jesus F. Christ, what in hell is wrong with these people? 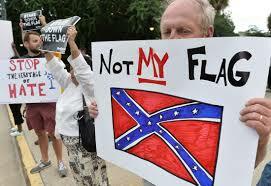 Time for the Confederate Flag to go!